Six Flags Hurricane Harbor will open in Phoenix. PHOENIX — Wet 'n' Wild is now Six Flags Hurricane Harbor Phoenix. The new name comes after Six Flags purchased the lease rights to the 35-acre water park last year. In addition to the new name, the water park was renovated with a Caribbean-themed entrance, more seating, updated dining area, and new entrances and paint for the water rides, according to a news release. The water park opens for the season on March 16. It is located at 4243 W Pinnacle Peak Road, near 43rd Avenue and Pinnacle Peak Road. 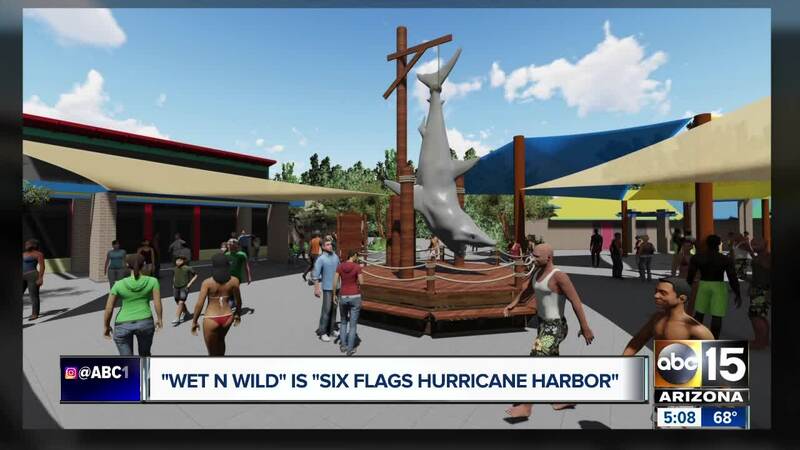 "Six Flags is a world-renowned leader in thrills and innovation and we are excited to add the Six Flags Hurricane Harbor name to our park,” said Donald Spiller, the general manager of Six Flags Hurricane Harbor Phoenix, in a statement. “Six Flags is investing in new theming and many other park enhancements to offer guests a bigger, better, wetter, island-getaway experience." Six Flags members and season pass holders will have unlimited access to the water park, as well as other Six Flags theme parks. A season pass to Six Flags Hurricane Harbor Phoenix starts at $57 and includes access to 16 Six Flags theme parks and special events. The other passes -- Gold Plus, Platinum, Diamond, and Diamond Elite -- vary between $7.25 and $18.25 a month, and include additional benefits, according to the Six Flags website . The park opens for the season on March 16. Members will get an early look on March 9 and 10. It has 30 water slides and rides, including a wave pool, the Constrictor, and Mammoth Falls.